from Wendy Lyn Watson's "A Parfait Murder"
I don't care what anyone says: looks matter. I've been trying to convince my husband Mike of this for years. He's a reporter for the Dalliance News-Letter, been working for the paper for almost 20 years. He should be the editor by now, but his career has stalled. Every time an opportunity passes him by, he makes an excuse. But I know that he'll never move up unless he starts dressing a little better. Gets the right haircut. The right car. Mike doesn't get it. He says he just isn't a suit-and-tie kind of guy. But he could be. Why doesn't he see that? I don't harbor any illusions that I'm beautiful. My Aunt Lenore--who was the third-runner-up in the Miss Texas pageant--always said I'm a "handsome woman." Not beautiful. But I do the best with what I've got. I dress smartly, I keep my hair done, and I never leave the house without lipstick, earrings, and mascara. Ever. My daughter Danielle, though, isn't just handsome. She looks like Aunt Lenore. Next year, we're making our big move: Dani's going to make her mark in the pageant circuit. Oh, she did a few local pageants when she was younger. Not those glitz pageants where the girls shake their behinds like little tramps ... the natural beauty pageants. This summer, she'll compete in the Lantana Round-Up Rodeo Queen pageant. Winning--and she will win--will set the stage for Homecoming Queen in the fall and for a series of state and national pageants during her senior year. Dani's a beautiful girl, and I've taught her the importance of keeping up appearances. She's going to be someone. I'm going to make sure of it. What do you think? Does image matter? Have you ever entered a pageant? Was it a good experience? 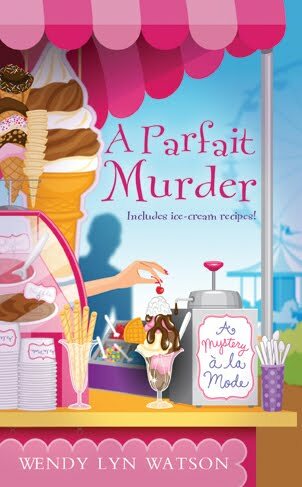 From Wendy: You can read more about Dani Carberry's experience with the Lantana Round-Up Rodeo Queen pageant in "A Parfait Murder" (due out in June). Visit me on the web and on Facebook! My daughter Haylee is beautiful. I love her for her kindness, her sense of humor, her talent, and her desire to help make a better world (though this last quality sometimes gets her into trouble). What do you love about Dani, Eloise, besides her beauty? What does she love about *herself* besides her looks? Unfortunately in today's society, looks are the first thing that gets the attention. but you need to have more than looks - intelligence, morality, and sensitivity to others. If you are not beautiful on the inside then I don't think the outside matters. Perhaps you should give your daughter a second look, Eloise. Behind the outer beauty, what's there? I hope there's lots of inner beauty and that's what you should focus on. If so, you're a lucky Mom! Oh, Eloise ... I knew I shouldn't have given you the reins of the blog today! I once wrote a short story about a pageant queen who'd do *anything* to win. Hope Dani doesn't turn out like that... LOL. I'm with Vivian, Eloise. Inside matters first. And be gentle with your daughter. Some girls, pretty as they might be, don't want to be in pageants. Make sure you listen to what she wants, and not what you want, okay? Just saying.